iGEM team TU Eindhoven 2014 uses Methanococcus jannaschii tyrosyl-tRNA synthetase(Mj TyrRS) for the introduction of a phenylalanine like amino acid into a membrane protein. The non-natural amino acid that has been used is p-Azido-L-phenylalanine (pAzF). This system contains pylT tRNA and two times TyrRS. To prove whether or not the tRNA synthase works, an assay has been done in which the pAzF has been used. The function is characterized by the expression of the protein with the non-natural amino acid, because it was not possible to examine the expression of the tRNA synthetase itself. As long as the protein is expressed, the tRNA synthetase must work else the amino acid will not be incorporated and the transcription will terminate at the TAG codon. The non-natural amino acid that has been used, p-Azido-L-phenylalanine (pAzF), only reacts with a DBCO group. 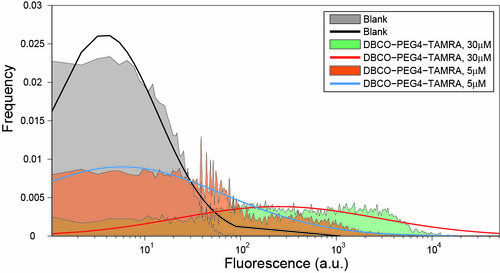 For this assay fluorescently labeled DBCO has been used to characterize the presence of pAzF. 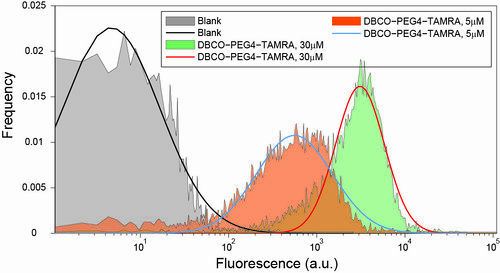 For the protocol used, see: http://2014.igem.org/Team:TU_Eindhoven/Protocols -> FACS for sorting with DBCO-TAMRA. The results show that in two types of proteins the non-natural amino acid is present. (Figure 1 and 2) Therefore the tRNA synthetase must work properly.